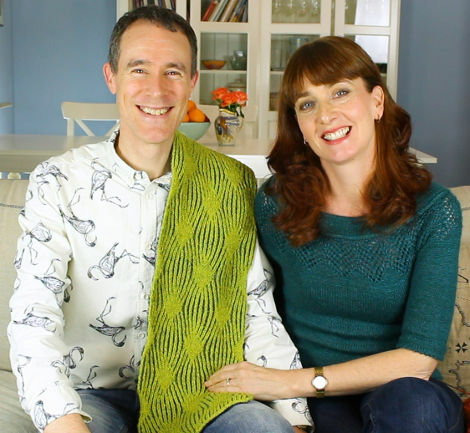 Episode 47 of Fruity Knitting starts in Sweden, with our first interview guest, Karin Kahnlund, who is an expert in the old Swedish style of knitting called two-end or twined knitting. Karin has done extensive research into this technique, has collected original garments and also reproduces historical garments to help preserve the tradition. Karin shows us some of her collection, demonstrates the technique and also tells us some fascinating stories in this fascinating interview. 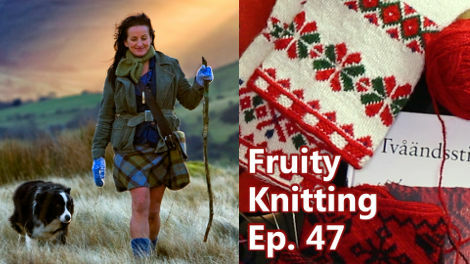 Fruity Knitting – Episode 47 – With Karin Kahnlund, Alison O’Neill, Pia Kammeborn and more! We stay in Sweden for New Releases, where the lovely Pia Kammeborn introduces us to Roses are Red, her latest mitten design. 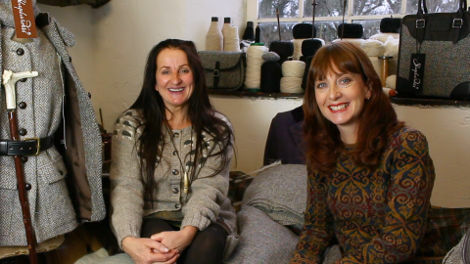 From Sweden we go to the UK to meet Alison O’Neill, a traditional hill farm Shepherdess, who creates beautiful tweed from the fleece of her own flock of sheep. You’ll get an update on our own projects – finished and in progress, and there’s news on KALs finishing and KALs beginning. Enjoy! 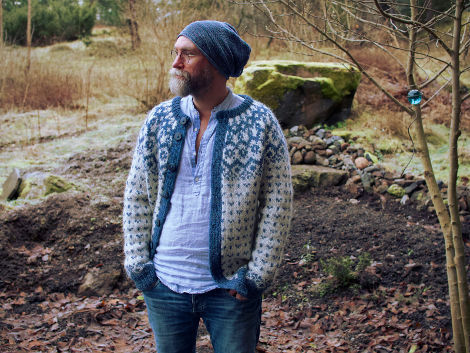 Karin Kahnlund has become an expert in the almost lost craft of two-end or twined knitting. Two-end knitting was the dominant style of knitting in Sweden before the 19th century, and is particularly suited to this cold climate. Although it takes longer than standard knitting, two-end knitting produces a garment which is both long-wearing and extremely warm. These properties made it attractive for everyday wear, particularly in warm and durable mittens, but also for festive garments. 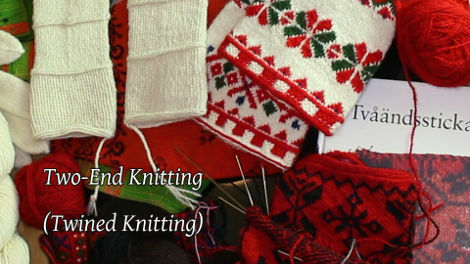 Most of the decorative techniques of standard knitting, such as intarsia and stranded knitting, can be used on a base of twined knitting, to produce colorful and festive garments that last for many generations. Alison is living history. She shepherds in the the same tradition that shepherds have done for hundreds of years in the Yorkshire Dales. Alison is tough and practical but also glamorous and romantic. Her flock is a combination of Kendall Rough Fell, Herdwick and Swaledale, all breeds that produce beautiful and hard wearing tweed. 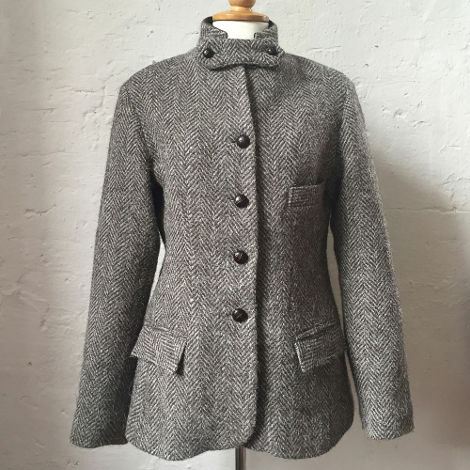 The fleeces are milled and woven in the UK, then made up into stunning, traditional garments like the gorgeous Land Girl jacket below. The Land Girl Jacket. Practical but elegant, like Alison herself! Pia and her husband Dennis have a charming and beautifully put together Podcast called Kammebornia. When you watch it you will be transported into a gentle land of beauty, thoughtfulness and soft humour. Pia’s beautiful designs also have a timeless beauty. They are well written in both Swedish and English with supporting video tutorials showing you the construction techniques involved. 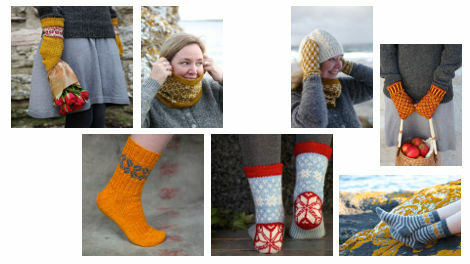 Fruity Knitting Patrons can get a 20% discount on all of Pia’s patterns. 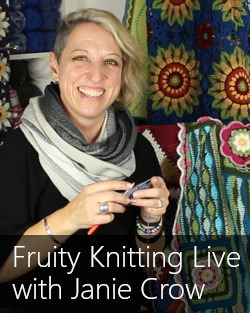 You can find the full details here on the Fruity Knitting Patreon post. Congratulations and a big thank you to everyone who participated in the Fruity Steeked KAL (#fruitysteekedkal). The creative energy put in and the beautiful works that come out are so uplifting. Trying out a new technique can be daunting, so we are always particularly impressed with first-timers. 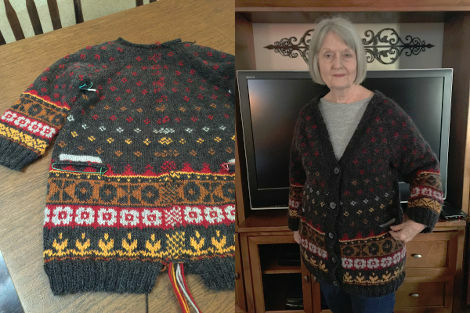 Jan, from Sherman, Texas, (jrutherford) made the Jenny at the Fair cardigan by Mary Jane Mucklestone. 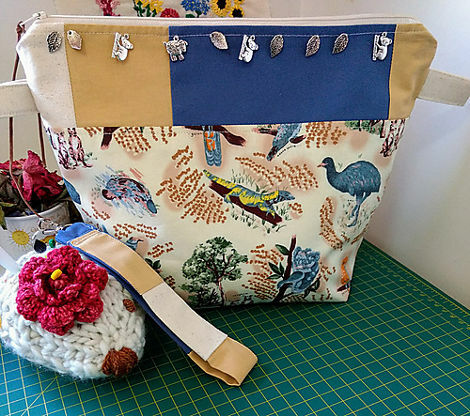 If you’ve been following the KAL thread you will already have seen the beautiful project bag, featuring Australian wildlife, created and donated by Made by Ganache, who you can find on Etsy. 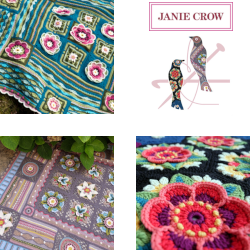 We’ll be sending that out to Jan to enjoy using for her next project! Congratulations, Jan! Thanks to “Made by Ganache” for donating this beautiful Aussie project bag! 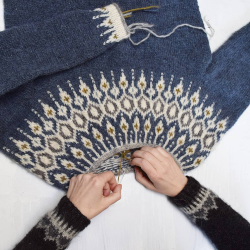 Christine, from Stockholm, Sweden, (nishiknits) created the Vetur by Védís Jónsdóttir, but actually converted it from a sweater into a cardigan – all the more to steek! 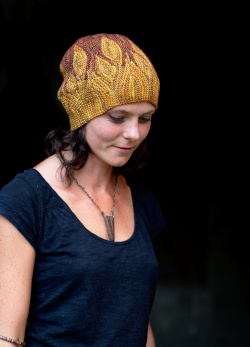 We are really happy to send Christine a pattern of her choice from the portfolio of our guest Pia Kammeborn. 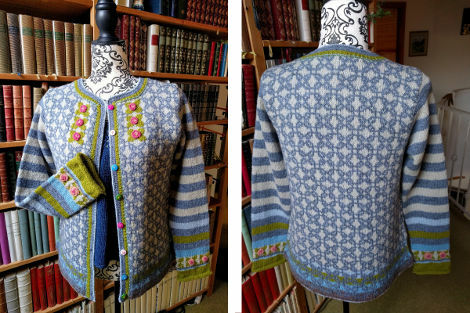 Isabelle, from Ollon, Vaud, Switzerland, (filidhruadh) created the Rosebud Jacket by Sidsel Høivik. 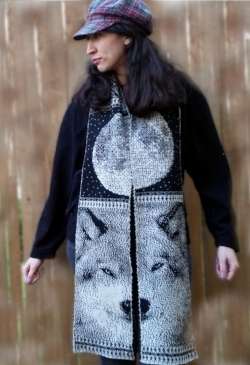 If you check the finished objects thread, you’ll see that this was actually the third garment that Isabelle submitted. The first two were children’s jackets, which served as smaller practice projects to warm up. (I can relate to this approach. Andrea, on the other hand, tends to dive straight in…) You can find our interview with Norwegian designer Sidsel Høivik in Episode 30. Isabelle will be receiving a copy of Susan Crawford’s upcoming book, “Vintage Shetland”, just as soon as it is published! We are all happy that Paris’s Scarf by Nancy Marchant is off Andrew’s needles. It has a few thousand Brioche Barks and Burps and Yarnovers and Andrew finally feels confident in basic Brioche and Double Knitting. Andrea has been talking a lot about the modifications that she makes on her projects. We thought it would be great to create a forum where people can discuss the changes that they make to their projects. There will be many different body types and style preferences so everybody should learn something by reading through and participating. 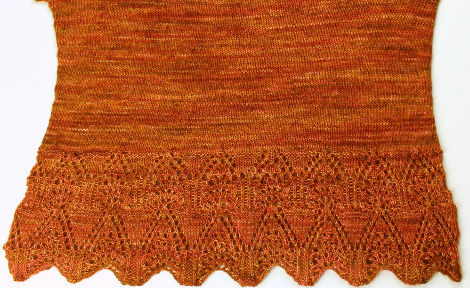 The details for this KAL will be in the Ravelry thread. Since Andrea has had some requests to talk about blocking, she made a short bit of footage on some of her thoughts about blocking while showing how she did it on Tegna by Caitlin Hunter. Thank you for another inspiring episode. I had never heard of Shepheress. Beautiful scenery, creatures, fabrics, music, and stories. I am so sorry I didn’t know about her walks when I was in the Lakes District! Also, listening to Pia describe here Roses are Red pattern, in English, was a treat. I watch her videos with Dennis and listen away to the Swedish I do not understand. Although I display the subtitles, I frequently forget to read as I watch them. 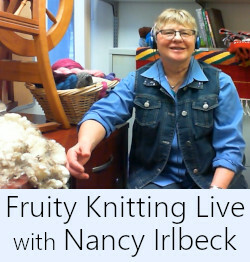 Looking forward to future episodes of Fruity Knitting. Hi, in the Netherlands a cardigan is called a “vest”! 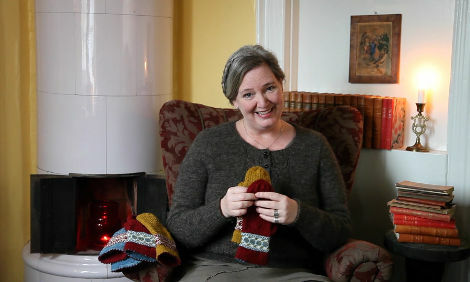 Really loved the segment on twinned and 2 ended knitting. My only suggestion is to get really really close-up views of the knitting. I would have loved to be able to see individual stitches on the historical pieces. Thanks Alicia. We’ll remember your suggestion for the future. A + A.
Hi Danielle. Check out Episode 37! Cheers, A + A.
I came across your podcast on youtube by accident and I am so glad. I love your podcast and hope you will carry on with what you are doing. You are both fantastic and such an inspiration!!! Have you done any crocheting Andrea? Or thought about it? ?